It was a discovery beyond belief, and its timing couldn’t have been better. Mystic Seaport’s shipwrights were hard at work restoring the Charles W. Morgan, the world’s last wooden whaling ship, for her 2013 relaunch. But they were starting to run out of the project’s most crucial element: wood. The wood needed to restore this massive 19th-century ship had to be very, very big and strong. 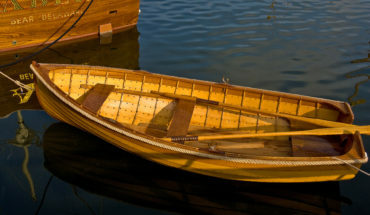 A typical amidships plank can be 40 feet long, a foot-and-a-half wide, 31/2 inches thick, and weigh hundreds of pounds. When the Charles W. Morgan was built in 1841, finding trees that were large enough was not hard to do. But after a half century of logging, it’s difficult to find trees of a suitable size. As far back as Hurricane Hugo in 1989, Mystic Seaport had been developing a network of people — everyone from plantation owners to highway officials — who could notify them when appropriately sized trees have fallen. When magnificent trees that have been downed by storms find new life in a historic ship, it offers a sense of comfort to the communities that have lost them. 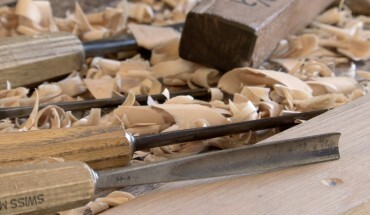 In June of 2010, just as the Museum’s shipwrights began to run low on wood, crews working on a new hospital facility in Charlestown, MA, accidentally came upon a huge cache of pristine white oak and live oak timbers that had been buried in the briny mud of the Charlestown Navy Yard for almost a century. It was about a soccer field’s worth of timbers hand-hewn by masters of the trade specifically for ship building. Mystic Seaport shipwrights say it felt as if history reached through time to give them a gift right when they needed it most.